And just like that, National Poetry Month is nearly over — our hearts are heavy, and our to-read lists grew as much as they shrank this April. In our last NPM and Beyond! blog post, we wanted to chat with some of our shortlisted authors about their reading habits and recommendations. Find out what books Beth Everest, Dean Steadman, Barry Dempster, Ingrid Ruthig, and Margo Wheaton hold dear, recommend, and were inspired by! Ingrid Ruthig’s and Margo Wheaton’s debut books are shortlisted for the 2017 Gerald Lampert Memorial Award, and Beth Everest, Dean Steadman, and Barry Dempster are all on this year’s Raymond Souster Award shortlist. LCP: What are your favourite books of all time? Why? Dean Steadman: This is always a difficult question for me to answer. I’m 66 years old and there have been many, many books in my life. A list of my favorites, I’m afraid, would read a little like an abbreviated index to the Canon of English Literature. Even to narrow it down to the writers that I most admire would make for a lengthy list. However, not to dodge this question entirely, let me say that I’ve been preoccupied lately with literary theory and the writings in this area of study by such people as Boris Eichenbaum, Vicktor Shklovsky, Roman Jakobson, and Jacques Lacan, to name just a few, have completely changed my understanding of poetry and language. For that reason alone, I’m grateful to identify their works as being among my favourites. New beginnings at this stage in my life are a welcome surprise! Ingrid Ruthig: That’s a tough question for many writers to answer, I expect. We read, we change, we move on… so favourites change. I’ve always read widely and eclectically, and I’m never bound to any one book for long. However, if I must choose something at this moment in time, I’ll say these two: Wuthering Heights, because it revealed to fifteen-year-old me how potent and fierce writing could be, even in an era that urged women into silence. And The Tenant of Wildfell Hall, because far-more-experienced me sees in it the best of all the Brontë sisters’ works, by representing what we might still aspire to: the will to claim independence and self-determination; a brave voice; and writing that pulls no punches, keeps it real, and remains relevant over time. Margo Wheaton: There are books that I find myself returning to again and again — in some cases, so often that the books have physically fallen apart. Collected Poems and Translations of John Thompson, edited by Peter Sanger is a book I especially cherish and is one of these. So are The Complete Stories of Flannery O’Connor and a Penguin edition of selected poems by Pablo Neruda edited by Nathaniel Tarn. As a teenager, I loved The Grapes of Wrath for Steinbeck’s compassionate characterization, biblically-infused lyricism and his respect for the material hardship of economically unprivileged lives, as well as his white-hot anger at the forces that caused that hardship. I still really love that book for the same reasons. Beth Everest: The two that come immediately to mind are Timothy Findley’s Not Wanted on the Voyage, and Jeanette Winterson’s The Passion for what I would call their anachronistic historical fiction, the development of character, and the surprise of image and detail. They are also damned good stories. I reread and reread the work of ee cummings, TS Eliot, Sylvia Plath, and anyone else who excites my mouth to speak aloud. 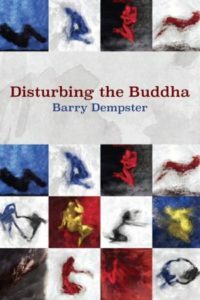 Barry Dempster: To start with the second question first, a particular book becomes a favourite usually because I’m ripe for it. Some books I read too early; they sped by just out of reach. Others I missed like trains to cities that by the time I tracked them down seemed so much less than what I’d hoped for or dreamed about. Timing is as much a part of the “why” as the beauty of the language or the originality of the thought. A few of the books that I was most ready for were D.H. Lawrence’s Women in Love, Laurence Durrell’s The Alexandria Quartet, Paul Bowles’ The Sheltering Sky, Annie Dillard’s Pilgrim at Tinker Creek, Pablo Neruda’s A New Decade: Poems 1958-1967, Henry Miller’s The Books in My Life, Kate Millett’s The Basement: Meditations on a Human Sacrifice and Edith Wharton’s The Age of Innocence. LCP: What are some books you read while you were writing your most recent book? 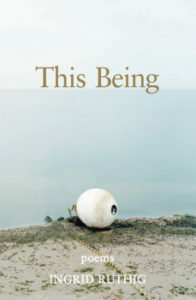 IR: This collection of poems was written over several years, and in that time I read too many books to recall titles now. In the final throes of shaping the manuscript, however, I know I didn’t read much poetry, if any. It’s easier to keep clear sight of your own work – its themes, its directions, how it wants to come together – if you haven’t got someone else’s themes and directions etc. fogging your lens. I did read a lot of crime fiction and biography, though. The former genre doesn’t inspire poems, which means I can fall asleep at night. The latter is a window onto other creative lives – rife with talents, foibles, and challenges – and it shores up my own endeavours by reminding me that no one has it easy. MW: Like most poets, I suspect, I choose what to read by a kind of osmosis. I follow my nose, my instincts, and read whatever the writing I’m doing at the time seems to need and require. My first book was written over a number of years, so I read a lot of different things during that time. Some books that were especially important to me while writing these poems were The Simple Truth by Philip Levine, The Branch Will Not Break by James Wright, both volumes of The Poetry of Gwendolyn MacEwen, a selected collection of Baudelaire’s poetry, and Miner’s Pond by Anne Michaels. DS: I read Alan Gillmor’s biography of Erik Satie and Ornella Volta’s compilation of Satie’s correspondence titled Satie Seen Through His Letters. My interest here was to learn more about Satie’s troubled love affair with Suzanne Valadon and to piece together his involvement in the Paris Dada movement. But mostly while writing and editing the book, I listened to Aldo Ciccolini’s 5 CD box set of Satie’s piano compositions. 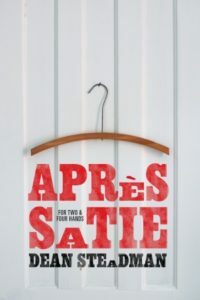 It’s Satie’s music more than anything biographical or historical that is present in the poems in Après Satie—For Two and Four Hands. In fact, there’s only a couple of poems in the entire book that actually refer to Satie specifically. However, the spirit of his music, I feel, is there in all of them. 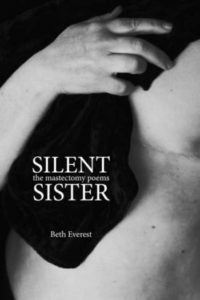 BE: I started writing the book when I was only a few months out of chemo and radiation, so the books I was reading were for distraction/relief/humor. I reread my daughter’s entire collection of Roald Dahl, for starters. And I always have a collection of poetry books near me to dip into so I can play my tongue around language. I know one of them was Micheline Maylor’s Whir and Click. What new or forthcoming books or poets are you excited about? Why? BE: I am a voracious reader. My creative writing students are a good source of eye-opening amusement. I go to a lot of readings and launches. I’ve recently been enthralled by Tyler Perry’s Belly Full of Rocks for its playfulness with folk tale (and I wish I had written it) and Heidi Garnett’s Blood Orange because of the historical truth. BD: I just saw that Dean Young has 5 new poems in the March/April issue of the American Poetry Review and that Marie Howe has a new book due out in May. Since this is Brick Books’ reading period (until the end of the month), as Acquisitions Editor I’ve been reading dozens of manuscripts and am blown away by all the amazingly talented, diverse Canadian poets there are out there. Looking forward to rereading Brick’s spring collection, including Kate Cayley’s Other Houses, Julia McCarthy’s All the Names Between, Clea Roberts’ Auguries and Wendy Donowa’s Thin Air of the Knowable. IR: I’ve just started to read a new biography of Elizabeth Bishop, A Miracle for Breakfast, by Megan Marshall. Biography and poetry in one! I might not sleep! 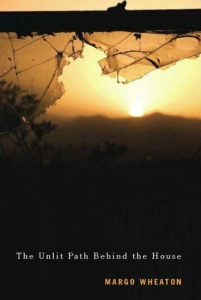 And I’m eagerly awaiting a copy of the newly released collected poems of Elise Partridge, The If Borderlands. Reading extends a person’s education, fills in gaps, offers new ways of seeing and thinking. And it can inspire too. …Or put you to sleep. Depending. But I don’t expect that to happen in either of these two cases! MW: Right now, I’m especially looking forward to Allan Cooper’s new poetry collection from Gaspereau Press called Everything We’ve Loved Comes Back To Find Us. I love the quiet power, inwardness and complexity of his work. I’m also looking forward to David Adams Richards’ new novel Mary Cyr as well as a collection of his poems and essays that Random House/Doubleday will be bringing out. I’m eager for the poems, in particular, because there’s an earthy lyricism and richly atmospheric quality that I admire in the ones that I’ve seen over the years. I’m greatly anticipating Robyn Sarah’s new volume Wherever We Mean to Be: Selected Poems, 1975-2015, due out from Biblioasis in the fall. I’m looking forward to reading this because of the intense musicality that characterizes her poetry and also for the technical mastery of her lines. DS: I keep waiting for Michael Ondaatje to release a new poetry collection. His writing has interested me for some time now and, as much as I appreciate his novels, it was his books of poetry during the sixties that were a major source of inspiration for me as an aspiring poet and a student of English literature. I’d be curious to see the form and content of a new book of poetry all these years later. What would it be that required poetic expression and not prose? However, I’ve got a feeling that I might be waiting a long time. Anyway, it’s just a curiosity and, my God, it’s not like there isn’t not a wealth of new poetry already available (let alone forthcoming) that I know I should be exploring. For that matter, I’m sure that there are shelves and shelves of books I should be reading but don’t even know about. Time, of course, is the big factor in all of this. There’s simply not enough hours in the day to do everything. Yes, I get excited about the new releases by Brick Books, BookThug, etcetera, but it’s an excitement quickly contained by the realization that I’m not likely to get to very many of them any time soon.